It is suggested by dental professionals that a child's first dentist visit should be by their first birthday. This is so the child gets comfortable with the sights and sounds of the dentist and of course to get their teeth examined. It is important to set a good pattern very a young age for a lifetime of good dental health. Darcy first visit at the dentist went really well, it was all over within ten minutes. I think I was more nervous than she was. She left with a big smile and a bigger sticker. I think that it is really important that a child has a good first appointment, the first dental visit for a child needs to be something that will have them coming back without protesting..
Today I thought I would share my five tips for making your child's first dentist visit stress free for all. Choose the right dentist, ask friends for recommendations or search children friendly dentists. Arrange a visit before their real appointment. Your child will feel more comfortable with going back there if they get familiar with the office and staff first. Don’t make it a big deal, act natural and relaxed about it. Tell your child they are going to see a new friend that will help them keep their teeth healthy. Mention to them the dentist office is just for children so it feels like it's a special place just for them. Let them bring their favourite toy or book, so that they have something familiar with them. Arrive early, there is nothing worse than rushing to an appointment it can cause unnecessary stress. When you are less stress so is your child. Also arriving early will allow them time to relax in their new environment. Don’t allow your child to eat too much before their appointment, sometimes if we are a little nervous our stomachs can get upset. Which we don’t want as we want them to feel as comfortable as possible. So those were my five tips to prepare your child for their first visit to the dentist. This post is in conjunction with The Centre of Advanced Dentistry Yorkshire, who provide high standards of dental care for all the family. They also offer affordable cosmetic dentistry, implants and more. 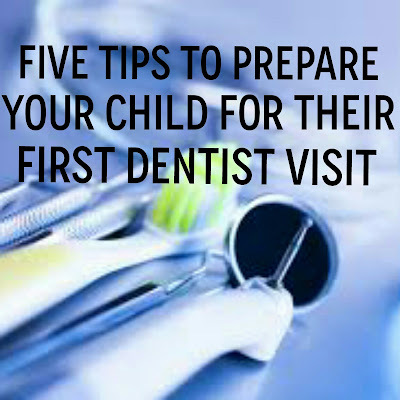 How did you prepare your child for the first visit to the dentist?